For this St. Patrick’s Day weekend, take the kids out to learn about physics, celebrate our beautiful open spaces, witness amazing Irish dance performances, explore art and so much more! Happening this weekend in and around Boulder. This month’s CU Wizards show, Much Ado About Absolute Zero, will be led by award-winning CU Professor of Physics, Paul Beale. Learn the story about heat and temperature, from billions of degrees during the big bang all the way down to absolute zero! Kids will explore heat, temperature, and entropy using hot, cold, and COOL physics demonstrations like infrared cameras, liquid nitrogen, and superconductors! This is a free STEM show for students ages 5 & up. For more info, click here. Join Macaroni Kid for its 2nd Annual Summer Camp & Activities Expo to help parents find the perfect camps and summer activities for their kids! This year, the event falls on March 17th, St Patrick’s Day. The event will include Village at the Peaks Kids Club activities and performances: bagpipers, Irish dancers, fiddlers, prizes, face painting, lots of games and kids crafts. Tinker Time is an opportunity for children to engage in art exploration at Tinker Art Studio. Several stations are set up with a variety of materials, and ideas and technique for use of materials are offered, but children have complete creative control and enjoy moving freely between stations. Paints, oil pastels, air dry clay, printmaking, fabrics and yarn, wire and wood sculpture, stamping, cut paper collage… are some of the mediums found during Tinker Time. For more info, click here. Join McGuckin Hardware in a celebration of Irish and Irish American heritage on St. Patrick’s Day! 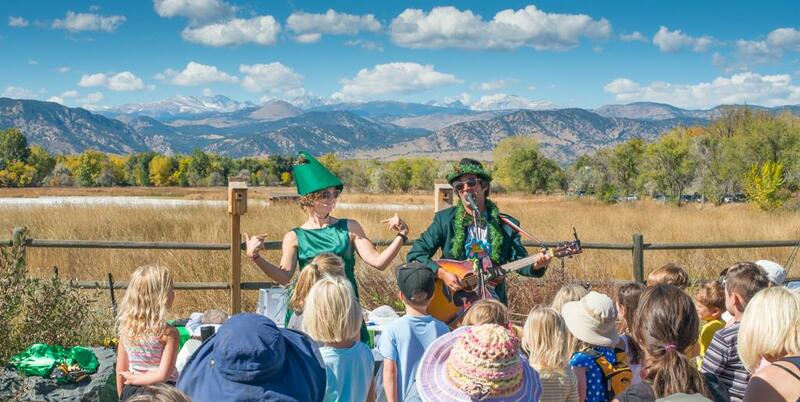 Learn how to make your own Potato Tower, try delicious samples of Irish Soda Bread and Cheddar Bacon Beer Bread from Great Harvest Bread- Boulder, CO., see a performance from Celtic Steps and McTeggart Irish Dancers. For the full schedule, click here. Celebrate spiders at World Spider Day at the Butterfly Pavilion. Spiders are critical to ecosystems and inspire technological innovation with their incredible abilities. However, spiders all over the world are threatened by over-collection for the pet trade, habitat degradation, and habitat loss. Join us for this event where you’ll learn more about the importance of spiders, along with what YOU can do to conserve them! A free, outdoor concert featuring Jeff & Paige by the new, top-of-the-line library playground. Sponsored by your City of Boulder’s Open Space and Mountain Parks Department as a thanks to our community, and a celebration of the future of Boulder’s undeveloped lands. In addition to the kids’ show there will be “Get to know your neighbors” learning stations, a values, hopes and concerns public art project, a drum circle and (hopefully) a chai garden. Rain or Shine! McTeggart Irish Dance Performance at WOW! Cost: Admission to Museum: Children (ages 1-11): $9, Adults: $5, Infants (under 1): Free, Members Always Play for Free! Get into the St. Patrick’s Day spirit with an engaging dance performance by the McTeggart Irish Dancers, Colorado’s Premier Irish Dance Academy at WOW! Children’s Museum. Performance is included with Museum admission. Music Together at the George Reynolds Library is an interactive music and movement experience for infants through 5 year olds and their caregivers. Family fun through singing, movement, instrument play led by Jane Smolens, Director of Mountain Song Music Studio, Inc. No reservations required, but space is limited. Generously sponsored by the Boulder Library Foundation.